Love the fact that she hooks her sweater collar all the way up to her chin. So many body turn shots, like those princesses would do in the movies, and of course she wears a princess tiara. She was a emo, deep down all emo girls want to be treated like a princess and loved. Video appeals to edgy manchild that feels prosecuted. Maybe she hooks her sweater to her chin because she tried to slash her throat then she felt cringe for the scar later on. Probably not, emos do self harm for feeling the pain and mom asking "my baby what happened" and teacher giving the extra glance, the silent and normal ones are the ones that do the lethal move, just thinking about it, planning it, doing homework before it then kabamm! How the f🅰️k do you know about it? I was kind of emo and didn't eat breakfast everyday secretly cry and hurt myself because I was sad and rebellious. I thought do I continue or what? I knew I couldn't be that edgy anyway I might as well stop. Her tone sounds like kids playing the pretending game. She is either scripting or have a really sad life, and people don't care about other people's sad life, when did you ever see a pathetic YouTuber? It's always "look at my awesome or interesting life". Once people know that she's real, most of them would just creep out. I suppose she's scripting, and people are not sure if she's real or not, and they play the "be yourself" positivity. @Morte Do you know you can't die? 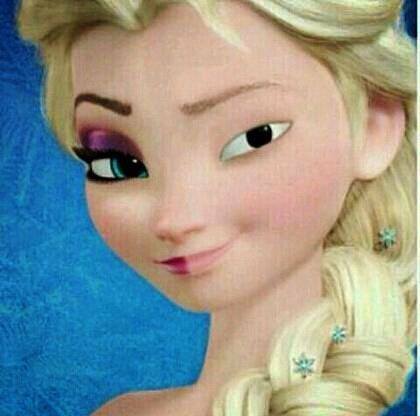 I think she got her huge eye shadow idea from elsa, except she used crayon. Yeah right you just teleport into another dimension. Didn't Rick and Morty teach you anything? Wake up sheeple! Ok dude f🅰️king stop that ain't true. I really want to say it's true to f🅰️k people around but it's probably going to keel somebody. Her videos are just talking about her life, a small YouTuber can't start the channel that way, nobody give a f🅰️k about nobodies on the internet. When a person is famous people start to care about his life. But she's got 268k subscribers, how is that possible? Maybe the reason why she dresses up like that is to get attention, dress up once, hey people really gave me an extra glance, that's how it all starts. She might be conscious about what she's doing, like Mr Tintoil. How else does she make a living? Even walmart won't hire people dressed up like that, she has a normal life, then dresses up to act in front of the camera, saying "this is the real me" "I am brave to not hide myself" or something. Feels like she hasn't grown up, she needs a mortgage and few bitconnects to help her get rid of her inner emo-acid princess. But I refuse if there's a big YouTuber with real personality on YouTube. I just watched her videos, she does admit she wants attention, multiple times, that's quite up-front, maybe she calls it out before other does, anyway nice. Emilia keeps saying she was malnourished, she could be filling in a niche for the "fat pride" community, getting boosted by YouTube algorithm because she's totally PC. Now that I have realized it's f🅰️king gold. Back then I just laughed at Raven, "emo b🚺tch kys hahaha", didn't know a personality was so valuable, now that YouTube was filled with mainstream Vevo Netflix stuff, I feel bad. Is it possible that emos are results of corporate strategy to sell kids stuff, like "edgy"? Maybe she's milking on it as well. Yes, I turned a random four year old into the person she's always wanted to become: me. I take back my words, her videos are really "I'm hurt" and wholesome, her comment section is wholesome as well. That might mean a teen audience with dreams and high idealistic morals. Well I lost my high idealistic morals when I got bullied in middle school, so I've seen through that bull💩. This thread is about the queen OK? She's the star now and you're nobody. Stop inserting your pathetic life into the conversation. Irrelevant. Nah, I'm just playing with you. @Wendy Ok that's nice, it hurts. Almost forgot I'm a just consumer, and she's a YouTuber, shouldn't have put my feelings into a product of show biz, that's exactly what she wants for a following, thanks for pulling me back. @noemie What? That's not what I meant. 💩 ton of definitions saying she's iconic around the same day on Feb 15 2018, seems like a meme to me. First the attraction, then familiarization, then retention. Pretty normal path of social media influencer. The genius part is that she's so ugly and bizarre people are attracted so she doesn't need a shout out, and she fits in the fat pride category, so YouTube won't hinder her indoctrination, lol. I would say that's a more than generic social media influencer.